Everyone knows this. Everyone says, “don’t do it.” Everyone hates when others do it. So why do so many people still do it? There are many reasons. Some don’t feel comfortable speaking to large groups. Some don’t know what they’re talking about. These are all good reasons to read. The bottom line is that reading is distracting. Your audience will read along with you (actually, they’ll read ahead of you because they can read silently faster than you can read aloud) and they’ll only half pay attention to what’s on the screen and what’s coming out of your mouth. How can you prevent reading your slides? The other points in this post can help (e.g., know your material, rehearse, use images, etc.). But also reduce the number of words on your slides. Don’t use bullet point lists (or at least try very hard not to use them). If you must use a list, resist the urge to read it. If you must reference the list, talk about the items on the list without reciting them. Images in presentations are great for several reasons. They can be far better than words to convey ideas. If you practice using images, they can be a visual que to help remember what you want to say, without using a bullet point list. Good, well-placed images also captivate your audience. If you doubt it, check out this great presentation by Matt Homann (blog) on SlideShare. Involving your audience doesn’t mean that you have to invite people on stage to do a trust fall or get people chanting and clapping. Just ask a few questions, or invite them to ask questions as you go along. I like to poll the audience early on to gauge their knowledge about the topic. That gets them used to participating and it allows me to adjust how much time I spend on particular sections of a presentation. This is especially helpful if you’re on a panel and your fellow panelists go over their allotted time. It’s good to break the ice with a joke or funny story, but remember why you’re there. Unless you’re a comedian, then your purpose is not to have the crowd rolling on the floor. Humor can catch (and keep) attention, but if your topic is interesting enough, all you need is a little bit. A few months ago, I attended a excellent conference called The Audience Conference, which combined comedians and web gurus to explore how to engage an online audience. The concept is great: “The mixing of artists who truly do deal with audience and the web geeks who have so much to learn from them.” It was a great experience that I hope to write more about in the future. But one of the web gurus (who shall remain nameless) tried a bit too hard to be funny. Perhaps it was the environment that tempted him – on stage at Caroline’s Comedy Club in New York City. He didn’t flop, but his attempt at too much humor was distracting and it took a bit away from his real message. The lesson: don’t try too hard. 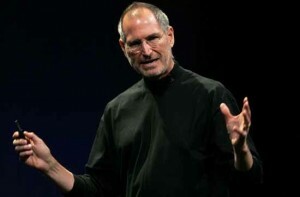 Steve Jobs is a master presenter. He effortlessly captivates his audiences in his famed keynote presentations and product launches. At least it seems effortless. But according to Carmine Gallo, author of The Presentation Secrets of Steve Jobs: How to Be Insanely Great in Front of Any Audience, Jobs spends countless hours practicing and rehearsing his presentations. Even when he experiences technical difficulties, Jobs is so well prepared, that he can improvise without missing a beat. Knowing your material backwards and forwards is crucial. Practice your presentation aloud — even if to an empty room. Record it and play it back to hear how it sounds. Make adjustments and refine. Presentation Zen blog and book . Nice post Patrick! I’ve been thinking about PowerPoint abuse, having witnessed a fair amount, and some quite recently.